So today, I did my first water marble! It is the most difficult nail art technique I have ever done! I am hoping practice makes perfect because when done right the results are awesome. Although I was incredibly intimidated, I had to try this technique after I received my Zoya Pinterest Mini Trios in the mail. Zoya had a Pinterest event for followers to pin their favourite Beach & Surf collection shades and the top three that were repinned would be made into a mini set. A code to receive the trio for free was given, and the first 2,000 people to check out with the code were sent the set. Though only one of my picks won (Zuza), I love all of the colours from the collection. I also really wanted to try Zoya nail polish after seeing so many great swatches! I posted this picture on Instagram, wondering what type of nail art I could do to incorporate all three of these beautiful colours. 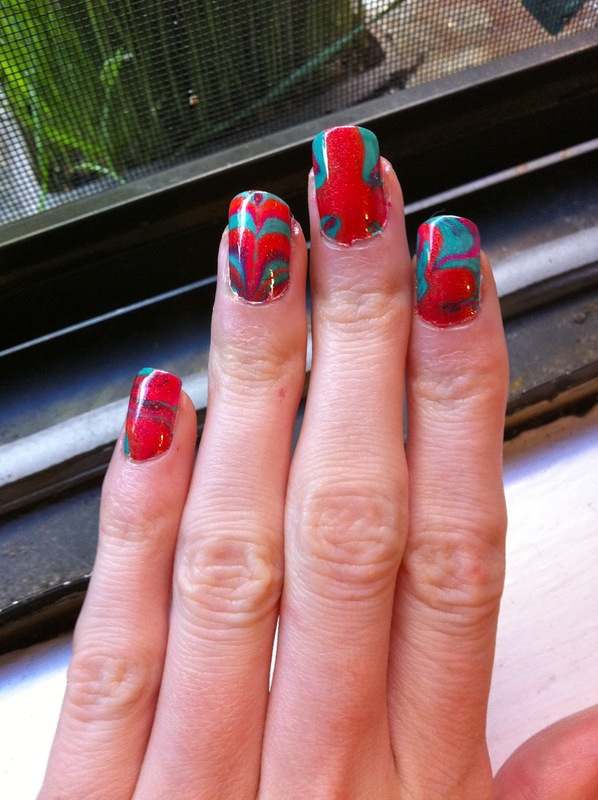 My friend asked me if I had ever tried Water Marbling. Though I have never attempted it before, I thought that would be a perfect way to showcase these beachy hues. Water marbling for me was definitely hit or miss! Some nails I really like how they turned out while others looked....not so good. The most difficult part for me was creating a design that didn't break or become too mixed (though I did find out that Kimber+Zuza equals a beautiful purple!) It was also hard, especially with my right hand, to dip my finger into the water. If I was any good at this, I would write up a tutorial but seeing as I am a complete amateur, I need some helpful tips as well! Anway, below are some pictures of my first try! I still think it looks super interesting & the colours are amazing so that definitely helps the overall look! I love my thumb & ring finger, the others not so much. 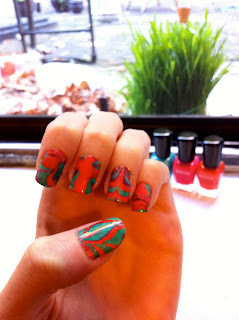 I know we have all seen the water marble mani & wanted to have that look on our nails! Don't be intimidated & try it out! If you have ever tried this technique, what are some of your tips for beginners?